January 12, 2014 Update: Please view this workflow PDF and check more recent blog posts to see my evolved thinking regarding some of the below. Best regards! Below is a list of books, websites, and tips that facilitate note-taking, outlining, drafting, citing, creating a bibliography, and editing. This is what helped/helps the co-authors successfully go from HAVING SOURCES to WRITING THE PAPER. Methods are actions. Methodology is the rationale, theory about, reasoning, and organizing scheme behind one’s methods. What is your methodology for note-taking, outlining, drafting, and honing? But do you need a reading, note-taking, and writing methodology? Can’t you just do what you gotta do and be on with it? In my opinion, at the scholarly level you need to be operating according to a conscious methodology to your reading, note-taking, and writing methods. Why? Well . . . I say don’t just read unthinkingly, take notes unthinkingly, etc. It would behoove us to adapt one or more of our mentors’ or predecessors’ methodologies for our own needs, uses, success, and sanity! I have encountered no methodology better–and MANY concur–than Dr. Single’s methodology as explained in her book “Demystifying Dissertation Writing: A Streamlined Process from Choice of Topic to Final Text.” I write about it here. I have grafted onto it Dr. Carlis’s advice here, Dr. Murray’s advice here (I read a previous edition, and I share a bit here and here about getting unstuck by doing her methods using note cards), and Dr. Gopen’s advice here. The result is a personalized workflow utilizing certain strategies and tools which works for me and might not work for anyone else. The resultant writing methodology and workflow are diagrammed here, tools, websites, and video links included. Citavi: for annotating, quote-extracting, and assigning quotes, notes, thoughts, and images to places on your Citavi outline. Please visit Citavi’s website, particularly pages http://www.citavi.com/en/features.html and http://www.citavi.com/en/support.html#videos. Idea Mason: for implementing Dr. Carlis’s one-draft dissertation methodology. Even if you don’t use Idea Mason or desire to write your dissertation in one draft, this methodology is wonderful to use! 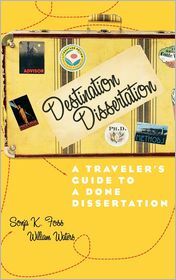 It resonates very strongly with Dr. Single’s writing methodology in “Demystifying Dissertation.” Idea Mason enables you to attend to every suggestion of Dr. Carlis’s, and then some. It is amazing to use for going beyond outlining to create a story tree that functions as road map for writing your paper . . . and for sketch-writing iteratively as you go. A little about Idea Mason (which I can no longer use because it won’t work on my computer with Windows 8.1+): The versioning feature is GREAT. In Idea Mason I (1) chunked my writing and (2) iterated back-and-forth between looking at my notes, rough drafting, and tweaking my outline in ways I only wish I could in Scrivener (I still endorse Scrivener, though!). The ONE drawback: The only reason that I did any typing at all in MS Word, given that Idea Mason exists and plays so well with MS Word, is because the citation function in Idea Mason doesn’t quite work for me. That is why I view Idea Mason as an OUTLINING, THINKING, DESIGNING, and DRAFTING environment, but not a publishing environment yet (as of January 12, 2014). Other users disagree with me on this and publish just fine from it. Here are some screenshots and links to a series of older Idea Mason Videos I made. If you click a screenshot, it will expand larger in another window. I customized the menu items that are in the first screenshot, and by the time I’m done designing my paper in Idea Mason and sketch writing all along, I have a beautiful, balanced, road map for writing a first draft, complete with signposting and everything. 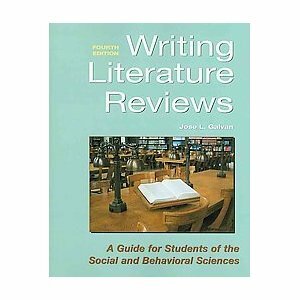 It actually facilitates fun academic writing, if you’ve done sufficient prewriting. 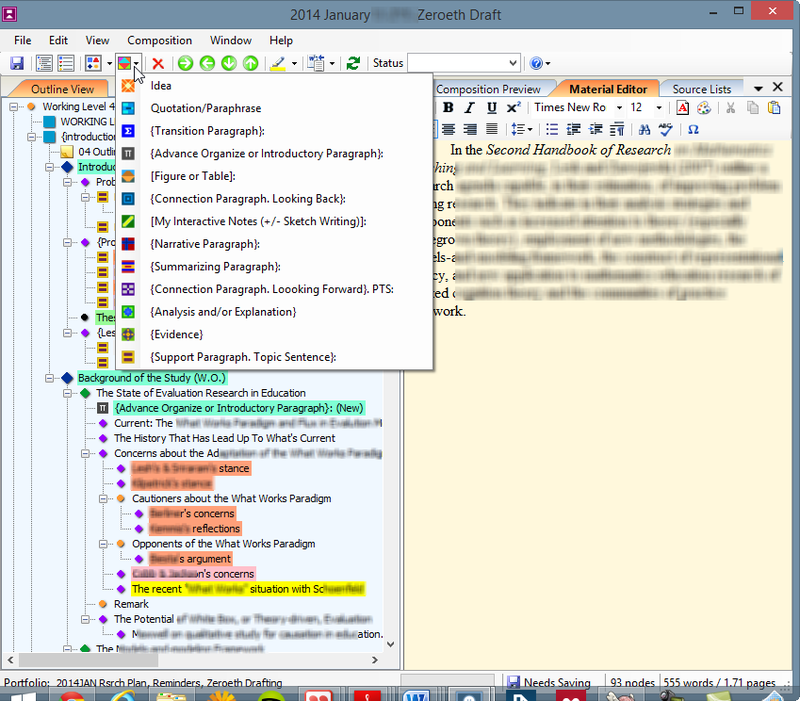 Scrivener: for great writing chunking, outlining, and drafting capabilities. Native to the Mac OS environment, there is a Windows version available that tends to lag in features of the Mac version. Check Scrivener’s user forum for tips on managing citations. Omm Writer: One of the best digital writing environment, emotion-wise. Here, just shut EVERYTHING out and enter peaceful zen-like writing. Deep . . . breath . . . in. Deep . . . breath . . . out. If you click on the above link, the video there gives the perfect demo. I have a tumblr at http://zatblossoming.tumblr.com/ that is a bookshelf containing the key books listed below. I can honestly say that I entered graduate school as someone who really just didn’t write. I avoided it like the plague in college. I did write in a personal journal and write poetry when I was younger. Because of the “writing factor,” I was really concerned about whether I should even attempt a graduate degree. That’s how I began my studies. Now, I absolutely KNOW that if I give myself enough time to do adequate prewriting, and if I give my first draft to someone to read for my blind spots or if I give myself a day to set the first draft aside and then make edits . . . I write reasonably well now. The books below have links at my tumblr: http://zatblossoming.tumblr.com/. Kaye is an amazing writer with credibility. The gist of the QWP (quick writing process)? I can’t do it justice with a summary, but here’s my attempt: Outline in a very PARTICULAR way, cognizant of the time, knowledge (familiarity/expertise), and space limitations you have AT THE CURRENT MOMENT. Be RUTHLESS about what makes the final cut. If you’d done this well, the raw draft FOLLOWS EASILY FROM SUCH AN OUTLINE. From here, you’ve got it with some VERY precise yet VERY doable editing. That’s my best “nutshell” summary of the QWP. He spells this out in detail, and the book is simply indispensable IMHO! I would add one caveat: For a thesis or dissertation, you’ve really, really got to READ to acquire the LANGUAGE and build from prior IDEAS with which you need to write. 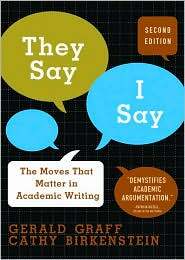 You can “just write” much, MUCH better when you have acquired the academic language for your relevant, key concepts. So just read, and QWP, and progressively draft. This is the way! NOTE: This book, along with Michael Crotty’s Social Foundations of Social Science Research and John W. Creswell’s Research Design are my academic research planning-writing-thinking BIBLES right now!!! So, there is a good and a bad way to view and use this book. Viewed and used wisely, this book is a gem, in my [Mickey’s] opinion. Viewed and used unwisely, this book is potentially unsound or harmful. 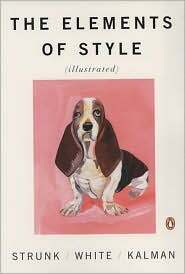 So let me be explicit: IF YOU PRIMARILY USE THE TEMPLATES (i.e the STRUCTURED SENTENCE STEMS) IN THIS BOOK AS THINKING and ORGANIZING TEMPLATES and not necessarily as writing templates (unless it makes sense to do so, of course), then this book will help you understand what sentences and paragraphs in academic writing are DOING and what you often will need to do in your academic writing. I am aware that the sentence above was a bit awkward, but I hope my point came across. Please post a comment if you have a question about either the book or my [Mickey’s] comment about it. Thanks! 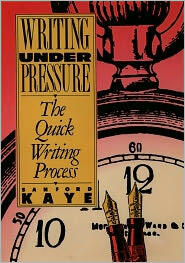 TIP: Writing is thinking: Don’t NOT start because you are waiting for perfect thoughts/prose. If this is your struggle, try the Quick Writing Process method (progressively refining an initially messy, typo-laden but comprehensive draft). 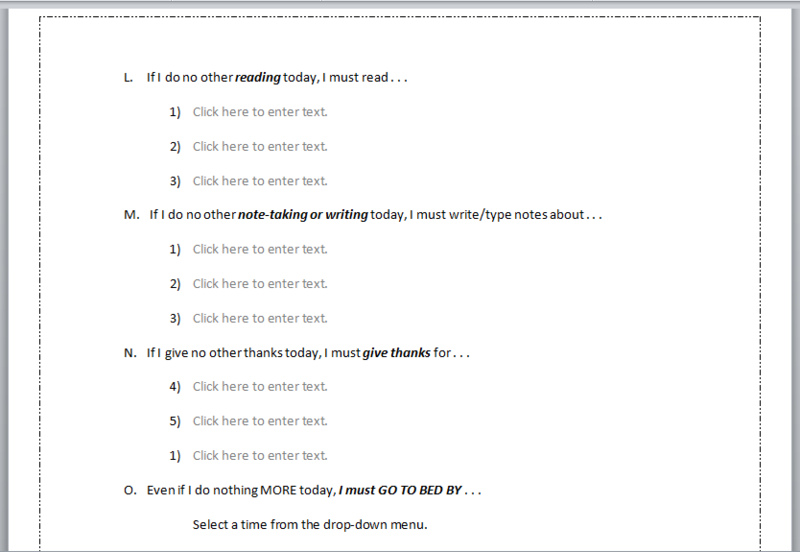 Or try typing around notes (see workflow idea below for details). More to come as more co-authors and visitors contribute. . . so please check back every so often. Thanks for visiting! Looking at your ‘WorkFlow’ (April 16) – am interested why you didn’t use CITAVI for much more of your work, where you instead used Mendeley/Qiqqa, since you ultimately came back to Citavi for successive tasks? I have used both M/Q, and feel that CITAVI just seems so much more . . . . . . more !?! Hi, justaman. 🙂 This is Mickey. Thank you for your comment. It is on point! I’ve now eliminated Qiqqa and work mainly in Citavi. Sometimes I revisit Mendeley . . . but just only to search for phrases, articles, etc. that I’ve lost. 15 ou bien 10 mn de examen(parfois moins voir foulée du fini). toi-même dévoilent ces visions lequel’ils obtiennent par flash alors ressentis. Vous restez maître de votre destin en agissant vous-même pareillement vous le sentez, en connaissant certains événements dont toi-même entourent.